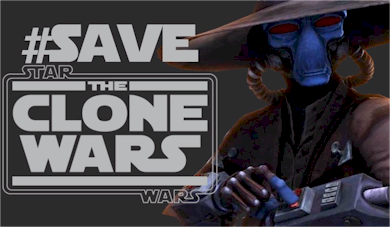 Kevin Kiner, composer for Star Wars: The Clone Wars, spoke with Mike and Brian from Full Suth recently. In episode "Special Release: Kevin Kiner" at the about the 20 minute mark, Kiner said that "we have about 10 shows that we're still working on," but he doesn't say how many they've completed. He also mentions that they are in negotiations for having a soundtrack as part of the "special material." Could this mean that the so called "bonus content" might only be available as a part of a complete series box set, instead of just bonus material for season 5 DVD/Blu-Ray? Kiner once again begins talking about the bonus content at the 33 minutes mark. Kiner does mention the iconic Yoda theme, and he says that Clone arc (Order 66) is really the best part of the series. To learn more about Kevin Kiner visit KevinKiner.com. A few days before, "Full of Sith" also posted the "Special Release: Attack of the Cons" featuring an interview with Dee Bradley Baker. Baker said that was sad to see The Clone Wars go, and that he's not sure how it will be finished or if it will be finished. He does say that he knows a couple of more stories are coming out, but he doesn't know when or how. He says that there is a lot that he wishes the fans could see. He briefly talks about the Order 66 arc which was originally planned to start season 6. Baker does say that it would be exciting for him to see any characters not killed off to show up in Rebels. He also thinks there a lot of fun and potential in that part of the Star Wars timeline. He says that the clones individuality and heart is his favorite part of what he's done for the show, and that's why the fans loved the show so much. Be sure to subscribe to Full of Sith in iTunes and visit there website FullofSith.com.